GC Engineering, Inc. (GCE) was responsible to provide professional services to Lower Valley Water District for the design of a sanitary sewer system for the McAdoo Acres Subdivision located in El Paso, Texas. GCE services included connecting approximately 9,000 feet of 8-inch diameter gravity sewer to the existing sanitary sewer system. GCE was also responsible for geotechnical analysis and characterizing site soils within the zone of the construction and determining the bedding requirements for the proposed sanitary sewer line. Services included reviewing the available information including reports, as-built plans, drainage reports, and other relevant documents for the project, reviewing the topographic survey performed for the project area by the survey subconsultant, designing an approximately 8-inch diameter, 9,000 feet long gravity sanitary sewer line including manholes, service leads, and connections to the existing sanitary sewer system and coordinating with the utility companies on the utilities to be affected due to the proposed project. 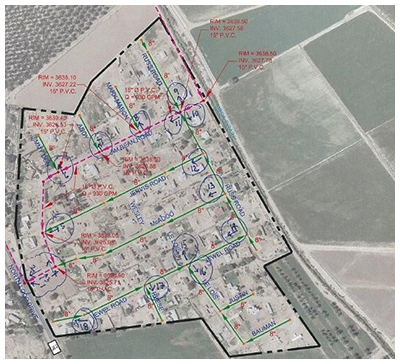 GCE developed design details for construction of the waste water collection system. Design details consisted of horizontal and vertical alignment of the sanitary sewer line, details for trenching and backfill, and manholes, details for connecting to existing sewer manholes and utility adjustments along the sanitary sewer line alignment. GCE services also involved preliminary and final design, preparation of construction plans, specifications, and providing construction support services.